I am a PhD student at Georgia Tech assisting in research regarding acoustic metamaterials. Each project I am working on explores core ideas or application of metamaterials. Metamaterials are a new class of materials that interact with acoustic waves in unique ways. If a metamaterial is vibrated at a predetermined frequency, it will behave like an object with a negative density or compressibility. Having the properties of negative density and negative compressibility are not found in any type of natural material. 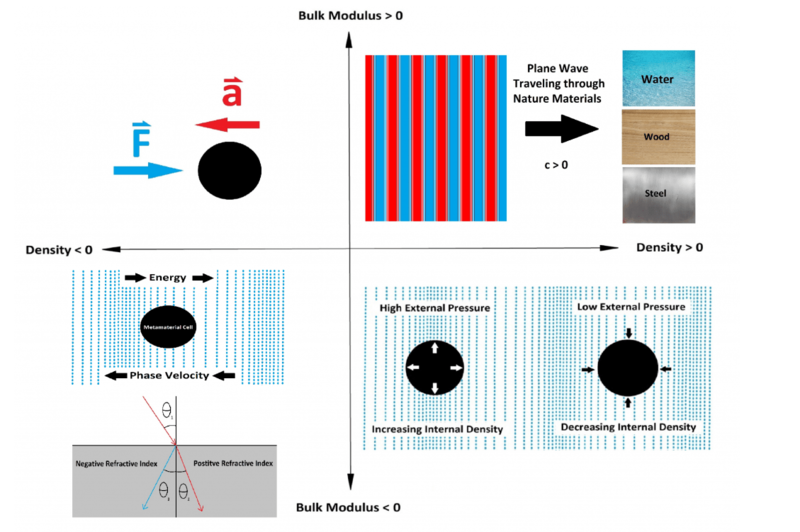 Because of these properties, metamaterials can make incoming acoustic waves behave in very interesting ways. Two observations that come to mind are metamaterials causing waves to reflect and transmit signals at the negative angle of what would be expected from a natural material. Another interesting observation is having waves phase front traveling backwards. These two observations alone lead to applications for acoustic super-lenses, and acoustic tweezers for biomedical applications. The image above illustrates the full spectrum of material and metamaterial properties when looking at the core elements of what makes a metamaterial. The axis shown are the compressibility (bulk modulus) and density.